Here 4 brand new screenshots of Grand Theft Auto IV courtesy of Rockstar Games, as well as one new artwork of a new character apparently named Faustin. More screenshots are available in our gallery, as well as our artwork page. A website called MCV says that GTA IV will be released on April 25th in the UK, missing the Easter release period. Sources close to Take 2 have told MCV this information. All of this would make sense if you look at Rockstars latest press release. As we have known, Rockstar says that GTA IV will be released in Q2 of 2008. April 25th is in this period, so it is possible. There is no fact that this will be the actual release date, so don't get your hopes up too much. Take Two Interactive released its financial results for the final quarter of fiscal year 2007 today, which ended on 31st October. Take-Two often reveal various articles of interest about its currently unreleased games during the conference call or in the press release itself, but sadly there was no set release date revealed for GTA IV, only confirmation that it would be in stores some time during the second fiscal quarter of 2008 - that's between February 1st and April 30th - for both the Xbox 360 and PlayStation 3. Also concerning GTA IV was the confirmation that the first package of episodic content will be available on the Xbox Live marketplace by 31st October 2008. The second of the packages will come some time after that, but before 31st October 2009. Additionally, during the conference call it was asked if Grand Theft Auto IV will be coming to Nintendo Wii. CEO Ben Feder replied with "there are other titles better suited for the Wii than Grand Theft Auto IV". This statement essentially confirms a Wii version will never see the light of day, but doesn't rule out Rockstar creating an alternative game for the console. IGN have posted a new article titled "The Characters of Grand Theft Auto IV". It includes 5 character profiles, for Roman Bellic, Vlad, Elizabeta, Manny, and Brucie, who were all seen in the latest trailer for the game. There's also 5 new screenshots included in the article, which will be added to our database as soon as we receive them from Rockstar. We'll also shortly be updating a number of our GTAIV pages based on the new information from recent previews and the third trailer. Grand Theft Auto IV has now received it's first rating, the OFLC in Australia gave it an MA 15+, similar to the majority of GTA games. This because it contains "Strong violence, Strong coarse language, Drug and sexual references" which is fairly obvious. Past GTA games have received their ratings roughly a couple of months before they're actually released, and so we could assume that the game is finished, at least to some degree. Take Two will be reporting their fourth quarter and fiscal 2007 results on Tuesday, so we may hear a final release date from the company then. We'll also be expecting ratings to be coming in from the UK, US and Germany very soon. Thanks to Matriculated for finding this. 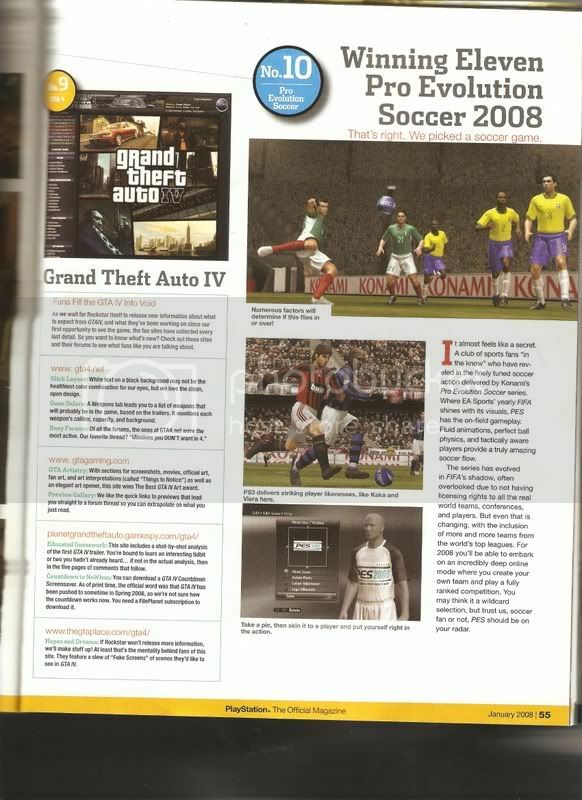 I just got the new Official PlayStation Magazine for the month of January 2008, and noticed that on page 55 there�s an article on GTA IV that lists TheGTAPlace.com as one of the leading places for new GTA IV info! This is great news for such a great site that I'm proud to call home. I added a poor picture of the article from my RAZR cell phone camera seeing as I don't have a scanner at the moment, I just think that it�s just so cool that we were listed and recognized as a leading site for news on such an amazing game, and that we have even better GTA info than even OPM itself! After seeing a company like Sony admitting to something like that, I just had to post something to point it out! I also added the picture just so you could all see if for yourselves. By the way I wanted to say I know that I have not been around much lately but with work, family and friends it's been hard finding the time to make a new mod. I am planning on making something new very soon. Thanks to Charger from our very own forums we now have a better image of the article that can be seen here! Yet more screenshots are appearing online! Rockstar are certainly making up for the months fans waited without any news on GTA IV by giving us a lot of stuff to enjoy over the past week or so. Today, Yahoo have posted a developer diary which details part of how Rockstar Games and Rockstar North have created Liberty City. The article includes some screenshots side-by-side with their real life counterpart, along with 4 new screenshots. Rockstar Games have just released the third official trailer for Grand Theft Auto IV. Check out the 2 minute long trailer over at the official site or GameTrailers, or in standard definition embedded below. If you want to download the HD version then click here for the 124mb .zip file. Two screenshots were also added by Rockstar to the official site, see those beneath the trailer. You may also be interested in an article IGN have just posted up - an informative Q&A about the new trailer. For example it mentions the artist and song used in the trailer which the vast majority of us will never have even heard of. The song is called King Ring 2 Kaiser (King Ring Remix) by Russian rap artist Serjoga Seryoga. Leave your comments in the topic to let everyone know what you thought of the trailer and how excited you now are. We're not sure how many more of these are coming but here are 3 new screenshots from IGN. Rockstar Games have released 2 more screenshots today, this time both are brand new. People's first reactions seem to be about Niko's slightly updated haircut, as well as speculation on Vlad's bar. View more GTA IV screenshots.